Brings the knowledge of 24 experts in this maturing field out from the narrow confines of academic circles, and makes it accessible to graduate students and power electronics professionals alike. * Provides practicing engineers with the knowledge to predict power requirement behavior. * The insights gained from this all-inclusive compilation will ultimately lead to better design methodologies. CHAPTER 1: INTRODUCTION (D. C. Hamill, S. Banerjee, and G. C. Verghese). 1.1 Introduction to Power Electronics. CHAPTER 2: DYNAMIC MODELS OF POWER CONVERTERS. 2.1 Introduction to Power Electronic Converters and Models (G. C. Verghese and A. M. Stankovic). 2.2 A Closer Look at Sampled-Data Models for Power Converters (F. Vasca, M. di Bernardo, and G. Olivar). CHAPTER 3: BASICS OF BIFURCATION AND CHAOS THEORY. 3.1 Introduction to Nonlinear Dynamics and Chaos (S. Banerjee). 3.2 Bifurcations of Smooth Maps J. H. B. Deane). 3.3 Bifurcations in Piecewise-Smooth Maps (S. Banerjee and C. Grebogi). 3.4 Nonstandard Bifurcations in Discontinuous Maps (/. Dobson and S. Banerjee). 3.5 The Method of Schwarzian Derivatives (C. K. Tse). 3.6 Coexisting Attractors, Basins of Attraction, and Crises (E. Fossas and G. Olivar). CHAPTER 4: EXPERIMENTAL AND COMPUTATIONAL TECHNIQUES FOR INVESTIGATION OF NONLINEAR PHENOMENA. 4.1 Techniques of Experimental Investigation (C K. Tse). 4.2 Techniques of Numerical Investigation (S. Banerjee and D. C. Hamill). 4.3 Computation of Averages Under Chaos (J. L Rodriguez Marrero, G. C. Verghese, R. Santos Bueno, and S. H. Isabelle). 4.4 Calculation of Spectral Peaks in a Chaotic DC/DC Converter (J. H. B. Deane). 4.5 Computer Methods to Analyze Stability and Bifurcation Phenomena (Y. Kuroe). 4.6 Computation of Operating-Mode Boundaries (Y. Kuroe, T. Kato, and G. C. Verghese). CHAPTER 5: NONLINEAR PHENOMENA IN DC/DC CONVERTERS. 5.1 Border Collision Bifurcations in the Current-Mode-Controlled Boost Converter (S. Banerjee and P. Ranjan). 5.2 Bifurcation and Chaos in the Voltage-Controlled Buck Converter with Latch (S. Banerjee, D. Kastha, and S. Das). 5.3 Routes to Chaos in the Voltage-Controlled Buck Converter without Latch (M. di Bernardo, G. Olivar, and F. Vasca). 5.4 Saddle-Node and Neimark Bifurcations in PWM DC/DC Converters (C. C. Fang and E. H. Abed). 5.5 Nonlinear Analysis of Operation in Discontinuous-Conduction Mode (C. K. Tse). 5.6 Nonlinear Phenomena in the Cuk Converter (C. K. Tse). CHAPTER 6: NONLINEAR DYNAMICS IN THYRISTOR AND DIODE CIRCUITS (/. Dobson). 6.2 Ideal Diode and Thyristor Switching Rules. 6.3 Static VAR System Example. 6.5 Jacobian of Poincare Map. 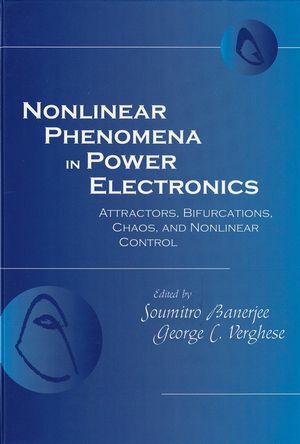 CHAPTER 7: NONLINEAR PHENOMENA IN OTHER POWER ELECTRONIC SYSTEMS. 7.1 Modeling a Nonlinear Inductor Circuit (J. H. B. Deane). 7.2 Inverters Under Tolerance Band Control (A. Magauer). 7.3 Nonlinear Noise Effects in Power Converters (P. T. Krein and P. Midya). 7.4 Nonlinear Phenomena in the Current Control of Induction Motors (/. Nagy and Z. Suto). 7.5 Analysis of Stability and Bifurcation in Power Electronic Induction Motor Drive Systems (Y. Kuroe). CHAPTER 8: NONLINEAR CONTROL AND CONTROL OF CHAOS. 8.1 Conventional Nonlinear Controls in Power Electronics (P. T. Krein). 8.2 Sliding Mode and Switching Surface Control (P. T. Krein). 8.3 Energy-Based Control in Power Electronics (A. M. Stankovic, G. Escobar, Ft. Ortega, and S. R. Sanders). 8.4 Ripple Correlation Control (P. T. Krein). 8.5 Control of Chaos (M. di Bernardo, G. Olivar, and C. Battle). 8.6 Closed-Loop Regulation of Chaotic Operation (J. L Rodriguez Marrero, R. Santos Bueno, and G. C. Verghese). 8.7 Control of Bifurcation (C. K. Tse and Y.-M. Lai). 8.8 Synchronization of Chaos (C. K. Tse). Soumitro Banerjee, Associate Professor, Department of Electrical Engineering, Indian Institute of Technology, Kharagpur, India Soumitro Banerjee has been at the Indian Institute of Technology, in the Department of Electrical Engineering since 1985. He currently teaches courses on 'Dynamics of Physical Systems', 'Signals and Networks', 'Energy Resources and Technology', 'Fractals, Chaos and Dynamical Systems' and 'Nonconventional Electrical Power Generation'. His research interests include bifurcation theory and chaos, and he has written and co-written over 43 papers on these subjects.